Zach Bruno (left) scored in Cherry Hill West’s 2-0 win over Lenape on Thursday. Nick LaRusso scored in the second overtime period to give the Cherry Hill East boys' soccer team a 1-0 win over Shawnee on Thursday. Nick Feldman was huge in net making 10 saves. 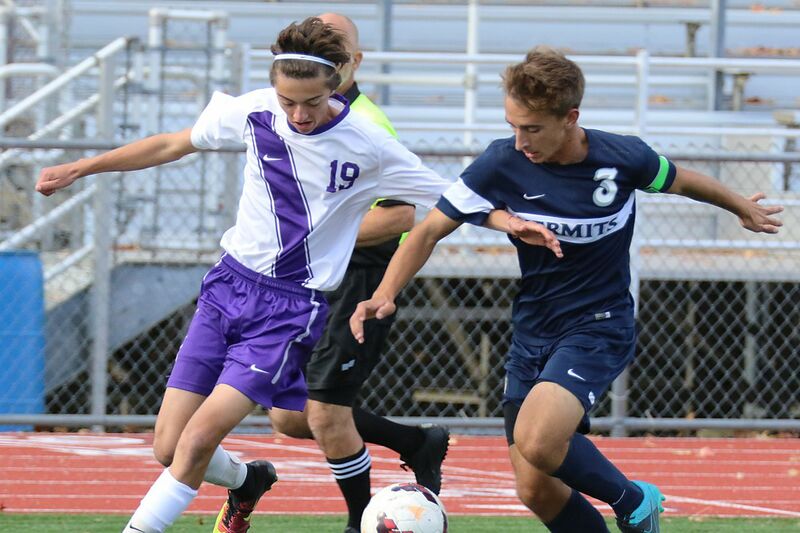 Zach Bruno and Khylei Neal scored as Cherry Hill West defeated Lenape, 2-0. New Egypt held off Holy Cross, 3-2, behind two goals from Chase Sempervive. Jeff Elliot's first-half goal gave Palmyra a 1-0 triumph over Bordentown. Liam Brett made 10 saves. Palmyra goalkeeper Liam Brett had 10 saves. JC Johnson netted two goals as Rancocas Valley blanked Burlington Township, 3-0. Katie Katella finished with a hat trick as Palmyra cruised past Westampton Tech, 6-1. Lily Beck added two goals. Maggie Londregan scored and Shannon Mulroy made five saves as Lenape defeated Cherry Hill West, 1-0. Carina O'Neill recorded a hat trick in Sterling's 7-1 victory over Overbrook. Maple Shade held off Willingboro, 4-2, thanks to a pair of goals from Amber Hickey. Madison Michalski and Kayla Olesky also found the back of the net for the Wildcats, who finished with 31 shots. Kalli Roskos' second-half goal propelled Delran past Northern Burlington, 1-0. Shawnee received goals from Kiley Endres, Alexandra Kornafel, and Madison McCready in a 3-1 win over Cherry Hill East. Olivia Loftin recorded a hat trick in Florence's 6-0 rout of Burlington City. Jelissa Reyes added two goals. Alexis Marker netted two goals as Cedar Creek beat Middle Township, 4-2. Isabella O'Shaughnessy scored the lone goal in Medford Tech's 1-0 win over Lindenwold. Medford Tech goalkeeper Talia Panton made nine saves. Pennsauken took down Pemberton, 5-1, behind Ruby Anyanwu's three-goal performance.